Important Collection of George Washington Material Leads Skinner’s Fine Books & Manuscripts Auction, October 30 | Skinner Inc.
BOSTON, MA – Skinner’s October 30 Fine Books & Manuscripts auction will feature one of the most notable collections of original signed George Washington material to be offered at auction in recent history. The material is diverse, and highlights Washington’s ongoing commitment to nurturing and maintaining Mount Vernon, important moments during the Revolutionary War, and the first Presidency. A large selection of material from the collection of Chicago’s late David A. Spinney opens the auction at 11AM and includes more than 20 original letters and documents bearing the signature of the first President of the United States. Lots are organized in chronological order allowing collectors and historians the opportunity to view Washington’s career by way of his life’s important highlights. (Lot 1, Estimated between $20,000-25,000) is a survey of land created in 1751 by a teenaged George Washington, who worked as a professional land surveyor between the ages of 17 and 20. The survey is followed by (Lot 2, $20,000-25,000) an important personal letter to Colonel Burwell Bassett Sr. written completely in Washington’s hand in 1773. 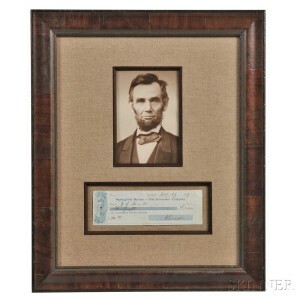 The auction also includes a large assortment of original documents signed by American presidents and other important historical figures. 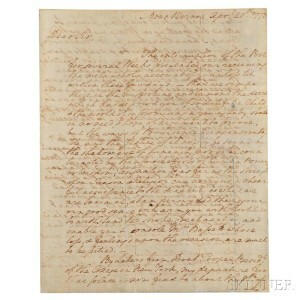 Of note is (Lot 42, $30,000-45,000) a collection of eight signed letters by George Washington, Abraham Lincoln, Ulysses S. Grant, Henry Wadsworth Longfellow, Charles Dickens, Napoleon Bonaparte, Horatio Nelson, and John Wesley. David A. Spinney’s collection continues with a fine and diverse selection of printed and illustrated books. In addition to his interest in the founding fathers, Spinney also collected material related to exploration with a focus on Hawaii, Alaska, Florida, and the American west. The earliest travel book from Spinney’s collection is Theodor deBry’s Brevis Narratio from 1591 (Lot 220, $20,000-30,000), which documents the indigenous population of Northern Florida as they lived in the 16th century. Previews for the auction are free and open to the public. Previews will be held in Boston on Friday, October 28 from 12PM – 5PM, Saturday, October 29 from 10AM – 4PM, and on Sunday, October 30 from 9AM – 11AM. Illustrated catalogs for auction 2940B and the George Washington collection are available from the Subscriptions Department at subscriptions@skinnerinc.com or from the Gallery. Prices realized will be available online at www.skinnerinc.com during and after the sale. The Skinner website also enables users to view all lots in the auction, leave bids, order catalogs and bid live, in real-time through SkinnerLive! Skinner auctions draw international interest from buyers and consignors alike, with material regularly achieving record prices. The company’s auction and appraisal services focus on fine art, jewelry, furniture, and decorative arts from around the globe, as well as wine, fine musical instruments, rare books, Asian art, clocks, Judaica, and more. Monthly Skinner Discovery auctions feature a breadth of estate material. Widely regarded as one of the most trusted names in the business, Skinner appraisers have appeared on the PBS-TV series, Antiques Roadshow, since the show’s inception. Skinner has galleries in Boston and Marlborough, Massachusetts, as well as in New York City and Miami, Florida, with bidders participating in person, by phone, and online. Join auctions live with SkinnerLive! and Bidsquare. For more information and to read our blog, visit the website at www.skinnerinc.com, find us on Facebook, or follow us on Twitter and Instagram. 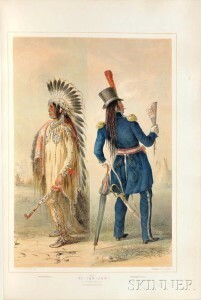 This entry was posted in News and tagged Abraham Lincoln, Alexander Hamilton, Bernard Picart, boston, boston auction, Charles Dickens, David A. Spinney, early illustrated books, early signed documents, fine books, founding fathers, George Washington, Henry Wadsworth Longfellow, historical documents, historical manuscripts, Horatio Nelson, James Madison, James Monroe, James Otto Lewis, John Adams, John Hancock, John Quincy Adams, John Wesley, Mount Vernon, Napoleon Bonaparte, rare book auction, rare books, rare manuscripts, skinner, skinner auctions, Skinner Boston, Thomas Jefferson, Thomas McKenney, Ulysses S. Grant by Skinner. Bookmark the permalink.